Ahhh, summertime! Mosquito bites, sunburn, chiggers, oh my! Read on and you will find that you don't have to spend a fortune on remedies; most of them are in your garden or kitchen cupboard. Herbs are nature's healers. Combined with oatmeal, baking soda and other cupboard staples, you can mix up a soothing herbal bath (or shower) blend in no time. If you don't have the ingredients needed, you can find them at your health store or order them online. Just be sure that they are grown organically so that your skin does not suffer from further irritation. 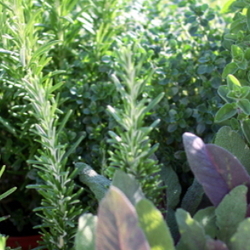 The following herbs are just some of the ingredients I grow and use in my bath blends. There are many others that you can learn about online or by checking out a book on herbs at your local library. Calendula - An easy to grow annual that provides healing properties. 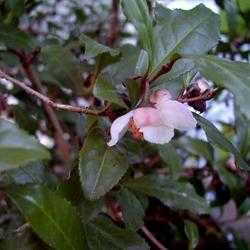 Can be used in bath teas, soap and salves. Elder Flower - From the elderberry bush, a very gentle, healing astringent. Softening and slightly fragrant in the bath. Lavender - A fragrant antiseptic that is soothing and healing to the skin. 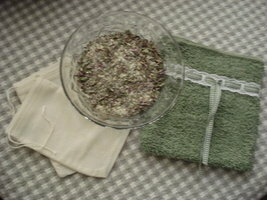 Can be used in bath teas, soaps and salves. Lemon Balm - An easy to grow perennial (in most areas) that likes part shade. Fragrant and cleansing. 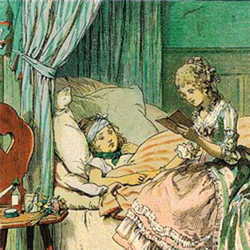 Peppermint - A very fragrant antiseptic. Works well in bath products, providing a cooling and refreshing result. Rose - Yes, roses are considered an herb! Helps to restore pH and great for irritated skin. Rosemary - A healing astringent. Soothing for aching muscles. For sunburns, I use the following blend. This turns into a dark yucky looking mess when wet, but is the most soothing blend I have ever used! It can be used 2-3 times, then tossed into the trash. Mix all ingredients and place in closed container. To use, fill a muslin bag, wet in the shower and enjoy! If giving as a gift, you can place the mixture in the washcloth scrubbie shown. They are easy to make. Cut a washcloth in half and sew a trim on the top that you can weave a ribbon or cord through. Sew the sides and bottom together and run ribbon through the trim to close the bag. If you need more detailed directions you can find them in the book Herbal Treasures, listed below. Use equal parts of any of the herbs listed above. Place in muslin bag or a large tea bag as shown in top picture. If using the tea bag, iron closed. Run hot water in the tub and toss in tea bag. Allow to 'brew' and step into tub once the water has cooled to a comfortable temperature. Lie back and soak. Can be used a second time. Listed below are some of my favorite herbal bath books. I use the basic information but adjust the recipes according to what herbs I have available. I live in the mountains of San Diego county in a tiny rural town. I inherited a love for gardening from my mother and use herbs and flowers from my garden to make bath products.